Ventanilla is one of six districts that make up the city of Callao, a port town next door to the capital of Peru. For years it has boasted a history of fisherman and acted as the main entry point to the shipping trade, but over time it has come to be more known as a region with high rates of poverty and a reputation of crime to accompany it. 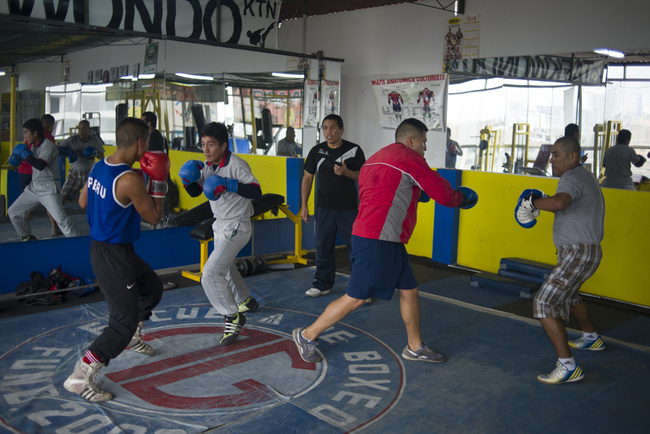 The first time I visited Ventanilla was in search of a grassroots boxing organization that I heard about from a group of boxing aficionados at the national boxing club in Lima. There I was told I would see why fighting sports were important. 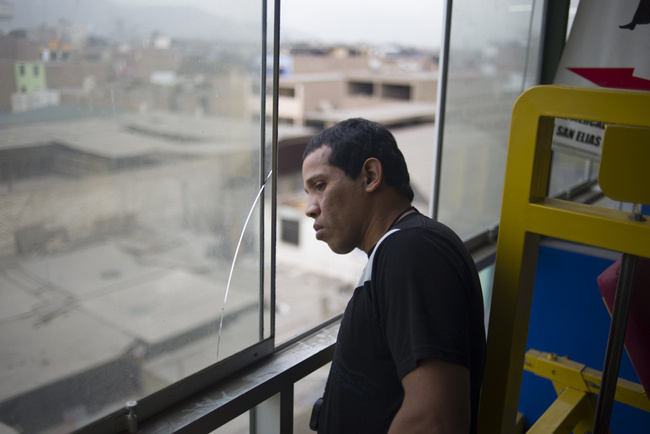 It took a good three hours to make it from the central of Lima to the neighborhood of Ventanilla. I remember taking an endless series of buses that lead us seemingly into nowhere until we finally passed by large white Hollywood-like letters that spelled out our arrival to the neighborhood. Our destination within the neighborhood, however, required an additional twenty-minute make shift taxi struggle up a sand hill, and a reluctant driver inquiring about our safety the entire time due to the infamy of assaults in the region. We stepped out onto a vacant concrete field that stretched the length of maybe half a football field, and the amber street lights signaled that the park was still in use, though residents hardly frequented the area at night. A group of young men slowly began to congregate around the field, donning blue jeans and nylon jackets to guard against the cold. These didn't necessarily look like fighters, or at least they weren't dressed as if they were about start training, but they were indeed the young men I had been told about. The session began with a lot of idle chatting, guys standing around with hands in their pockets, shifting back and forth with no real direction on what to do. There didn’t seem to be much of a regimen until someone called out from behind, and the young boys stood at attention much like a military troop would in response to their drill sergeant.The group was led by Erick Lombardi, a former pugilist who since retirement has dedicated his life towards training young fighters into championship grade. 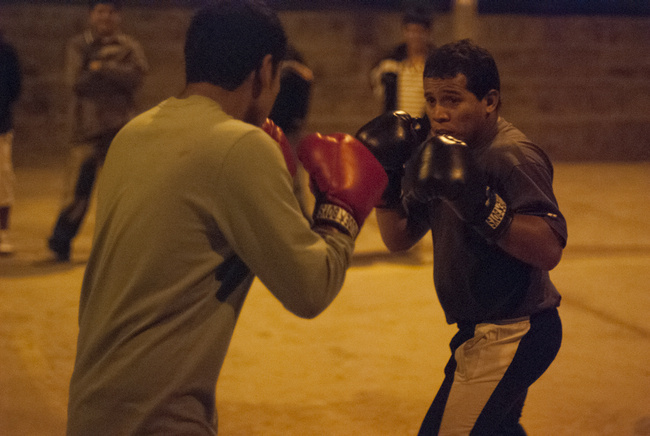 A Ventanilla native himself, Lombardi found the sport out of similar motivations as the youth currently involved in the project, and brings a keen understanding of his students’ situation. "When I was 14 going on 15, I didn't know what to do with my life. I skipped school one day to meet with a bunch of guys,but they never showed up. I couldn't go home and I couldn't go to school, so I walked alone on a street in Callao, without knowing that I was on a dangerous street. I walked into a boxing gym, and something about it impacted me so I stayed there,” Lombardi recounts. Lombardi spent ten years in the professional circuit, compiling a solid 14-4 professional record, though never reaching the world title he had sought after. According to him, he's now set on another path. “Boxing gave me the energy that I have today and I live to transmit this energy. It's the energy to calm a person that was like me at that moment,” Lombardi tells me when I ask about his draw to the sport. “Life didn’t want me to become a champion so now I’m training people to become champions. Now I’m here to write another story." The guys were pretty frank when talking about what they did to get by: robbing people or working as the fare collectors on the city buses. Fare collection doesn’t really inhibit the most lucrative recourse for survival, and with even that job prospect being hard to come by for guys from places like Ventanilla, I guess you could say I appreciated their honesty. Lombardi told me that this particular group of young men was the most dispossessed of the neighborhood, the ones without parents or accessible relatives, and their calling to the sport was one in search of community and belonging. And despite their questionable generation of income, they did want something better for themselves. Boxing was seen as a potential solution to straightening these things out. Lombardi started the session with some exemplary shadow boxing and the boys scattered into their own personal spaces to follow suit. The coach stalked through the crowd to correct any mistakes in form and offer his best advice. At this point, training sessions were infrequent and underfunded. There were no heavy-bags, no ring, not even boxing gloves beyond the one set they use to spar: a group effort put together by the boys’ collaborative earnings from robberies and fare collection. 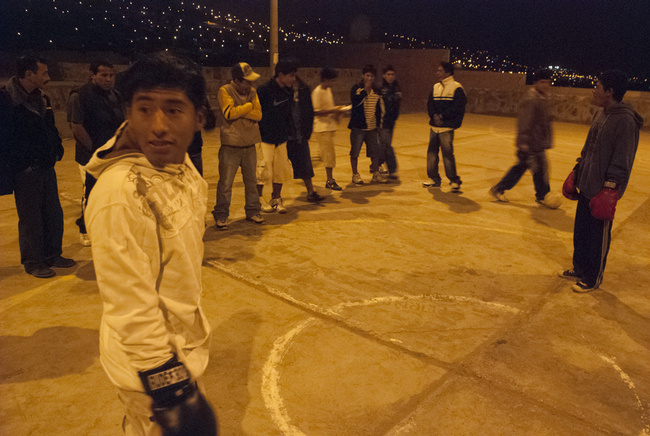 One boxer told me that they all shared this one pair (there were maybe 30 kids out that night), and took turns in pairs to spar one another with the onlookers giving opinions afterwards. Because Lombardi had other obligations outside of the neighborhood to supplement his own livelihood, there wasn’t a consistent instructional presence, and in many ways, these boys were literally teaching themselves how to box. Lombardi told me that the plan at that point was to sponsor one of the fighters to train in the city once in the week, then return to teach the rest of the guys throughout the remaining days. They all seemed unsure at the prospects of this proposal when spoken aloud. Five years later Lombardi is still dedicated to the project, but the plans have changed considerably. He named the project "The New Generation", saying his aim is to create a new generation of Peruvian fighters that are serious and dedicated to capturing championship gold. He also aims at changing attitudes towards education and looks to create a modern image of a fighter, one that is educated both inside and outside of the ring. I meet Lombardiat a bus stop near the airport and he takes me to a new location that he has rented out in the neighborhood Los Olivos. On the map Los Olivos is right next to Ventanilla, but from the site where I stood five years ago, the journey is about two hours round-trip. We descend in a neighborhood that appears to be going under massive reconstruction and oddly enough, also appears to be the area one would go if they were in need of purchasing building material. Lombardi leads me in front of a slim building sandwiched between two home-improvement stores, and one fighter is already waiting patiently with his gear in hand. All three of us climb past the first two floors, which function as a typical fitness gym with things like treadmills, free weights, and cycling equipment. The top floor where Lombardi runs his program isn't too different, plenty of weight machines and stand still bikes are scattered around the space. There’s no ring or any of the typical articles you’d find in a boxing gym, but there are at least a few heavy bags and a roof to protect the fighters from the elements. The gym has been operational for five months with an ever-present threat of being shut down since Lombardi funds the operations from his own pocket. He earns little from teaching private boxing lessons on the side, but the income isn't great, and certainly not enough to securely run a boxing club. "This project started with me and a friend, but he later left the project, so I do this with my own money,” Lombardi says. “We don’t survive with support. We survive from ourselves, our personal contributions and the events that we hold. I know I won't see the results for another six or seven years, but this is a project that I won’t abandon." The fighters begin to arrive and by the time training starts, I notice that the flock has slimmed down considerably. There are maybe eight fighters present, about a fourth of what I remember from five years back, but Lombardi tells me even that was a fractional representation of the whole. 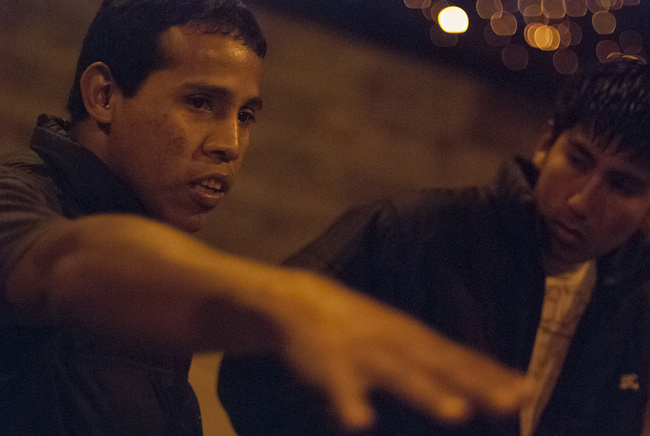 In total, there were 179 kids from the concrete field in Ventanilla, and since the new location couldn’t absorb a complete transition, Lombardi and some team members narrowed down the list, crossing off the overly aggressive, the non-dedicated, or those simply lacking the talent. From there they came up with a list of 12 fighters, those that wouldn’t be charged for sessions and supported in any related costs in training. While Lombardi shares the vision that boxing is meant for anyone and found great struggle in denying some kids the opportunity to train, in dire situations of funding, he had to be drastic. The ones he has taken in, however, have found a considerable amount of success. They've gone to Pan-American tournaments funded by their own means and medaled against fighters that had complete government backing. Having lived and traveled with national teams in the past, I know some fight teams are supported with anything from high-grade training equipment and nutrition to personal attendance from sports therapists. Managing to win medals against fighters of that caliber is an impressive feat for any team with no major backing, and perhaps even more impressive given both the fighters and the managerial team come from a place like Ventanilla. "They basically come from a marginal neighborhood, almost the entire zone is poor,” says Lombardi when I ask how he would describe Ventanilla to someone. “But just because someone is poor doesn’t mean they’re bad. It doesn’t mean they don’t have dreams. These are youth that can be more as athletes and citizens. Like Josue Perez; he’s one of the best students in the city and nobody thought that he would leave the path he was on. But now thanks to boxing, he lives a full life." Josue Perez is Lombardi's star pupil. At 20 years old, he's already made the transition into the professional ranks after an impressive run in the amateurs. The young fighter shows up well after the session has started, ambling in with caution as he's over an hour late to training. The first thing he does is apologize to Lombardi, explaining his need to stay late after class to speak to a professor. Perez is majoring in psychology at one of the national universities and is one of the top students in his class. Contrary to what most might think given his impressive amateur record, he won a scholarship solely based on his academic merits, and even his instructors were surprised when they learned he was a boxer. That's probably because Perez has one of the calmest demeanors I've ever encountered, and few would guess that his life aspirations lied in a sport where you punch opponents for a living. "I changed a lot because I was on the wrong path, doing bad things,” Perez recounts. “I was in the world of drugs. I was a bandit. I didn’t have the space to canalize this energy I had as a youth, but boxing gave me that [space]. It helped me a lot." Perez's claims of banditry are true, and are perhaps even a bit light. According to Lombardi, he was what they call in Latin America, "the boss of the neighborhood" before coming to boxing. Doing the math in my head, that would mean Perez was on top of the criminal food chain around the age of 13. At first I think I must have made a poor translation, but when I clarify the age question with Lombardi, he confirms the timeline. "He's a smart kid," Lombardi sums up. Perez's inception into the sport is eerily similar to that of Lombardi's. 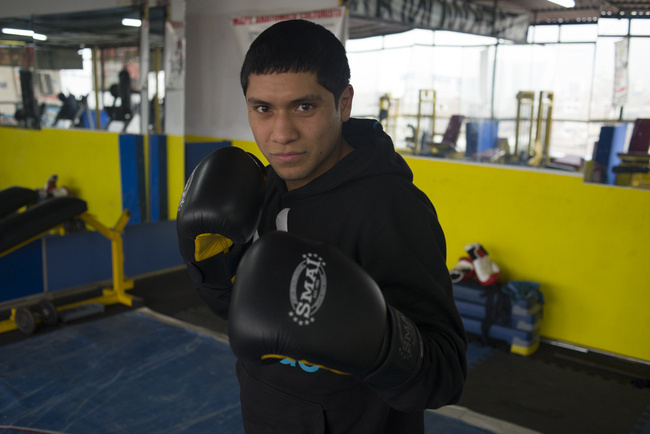 He too was skipping school and stumbled upon a boxing gym and got hooked. Inside that gym was Lombardi, and since then the two have stuck together. Since Lombardi's new pugilistic goal is to train those aspiring for a world title, the match appears to be perfect. "I want to be champion of the world, and be an example to the kids in my neighborhood,” says Perez. “I want that they can see that if you dedicate to something, you can achieve it. There’s a lot of obstacles on the path—lack of support, the economy—but if you love something, with patience, you can achieve it." 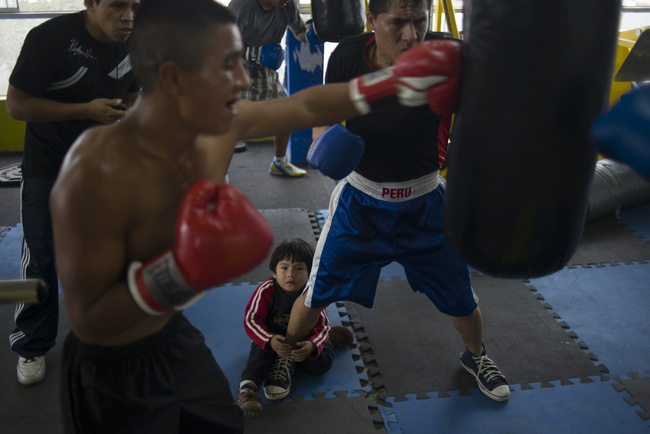 Beyond a new generation of boxers in Peru, I am also seeing a new generation of guys like Lombardi, guys who see the social benefits of the sport and want to spread those benefits to others in need. I can't be sure if Lombardi will one day find the fighter to fulfill that championship dream he fell short in achieving, but if he’s interested in passing on the tradition of using the sport to save lives, that legacy is in good hands.